Typically a buyer writes an offer and we have 5 business days to fulfill their conditions. An offer is an agreement that the Buyer will purchase this property on the condition he/she is approved for financing, approves an Inspection Report, and approve and review Strata documents. Here are the strata documents I review and sometimes the Listing Agent (agent for the seller) provides these documents late and the buyer has two days to review it. 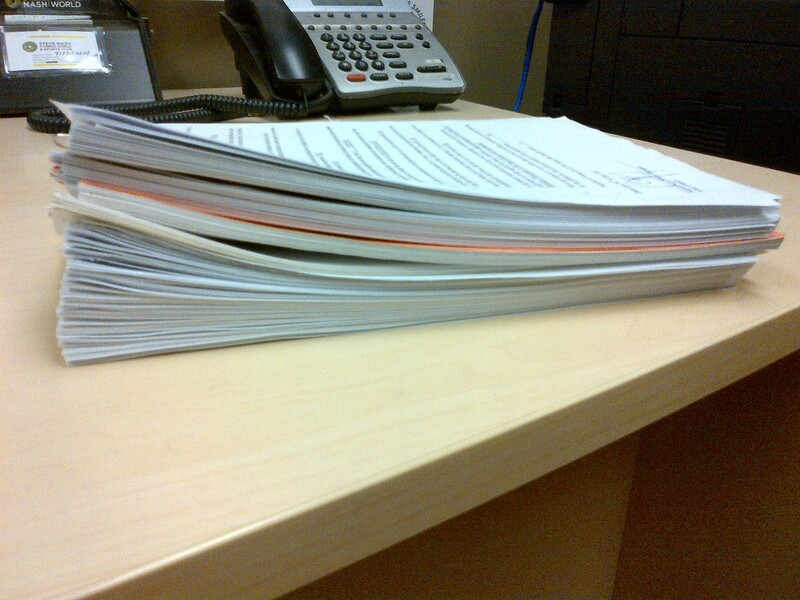 In this pile of documents, there is something called Strata Bylaws which outline the strict rules of the complex. In this document (33 pages for this building) there is one sentence that states, "Wall to wall carpeting with appropriate underlay is the only allowable floor covering within a Strata Lot". The bylaws do not boldface and underline this, and there is no heading that says, "Flooring Restriction" so thorough reading is necessary. Throughout the Strata Council Meeting Minutes, your read that numerous homeowners purchase a unit and renovate their home to only have to rip out all the laminate flooring they just installed within 30 days and face a fine. I've met someone who had to sell their home right after they bought it because the complex did not allow owners to rent it out. These bylaws state Rental and Pet restrictions. Also, some Stratas ban barbeques, smoking, hard surface flooring, and even piano playing during certain hours. Know what you are buying and if you aren't sure, it helps to have a Real Estate Agent on your side and make sure you are represented and protected. As you've all might have heard, Vancouver is the 2nd least affordable place in the world to live. If you read this article, it compares the median price of homes and the median household income. Vancouver is the second least affordable after Hong Kong. Vancouver's median housing price is $621,399 with a median household income of $65,200. Sydney, San Jose, and San Fran follow. Detroit is the most affordable of the metropolitan markets studied with a median price of$75,700 and median household income of $49,800. I hear all the negative things people say about Vancouver. It's usually about the traffic, wet weather, cold weather, hot weather (for a week in the summer), the Canucks, and the cost of living. You don't have to LIVE IN Vancouver. For the price of some 1 bedroom and dens in downtown, you can buy a 3-level, 3 bedroom townhouse in Port Moody or Coquitlam that is recently built. There are other options if you are willing to sacrifice some commuting time. I am well aware of the home prices for obvious reasons. You hear the same things over, that we have beaches, water, mountains for skiing and snowboarding, the beautiful interior that's not too long of a drive away, shopping, places to eat, some night life, and clean air and water. I think many take for granted what we have. I believe that any city you live in and work in, it will not be as easy to enjoy your surroundings and that is why many don't appreciate what Vancouver has to offer because you're busy with work, chores, errands, and so on. Talk to tourists or talk to people who in other countries you visit, many want to be here. If you complain about the prices, there are nice homes in the surrounding areas for much less. To the ones who really have nothing good to say about Vancouver, there is always Detroit. Listed by Kaiton Realty Group Inc.
Hope you and your family are off to a great start in 2013. In today’s current market when the sales volume has declined and buyers are on the sidelines, pricing a listing is key in selling your home. The market in Greater Vancouver peaked around April/May 2012. Prices have come down and a 15% decrease in price since the peak is not uncommon in some areas. The number of sales has declined. You can see from the chart below that the sales volume has decreased significantly from 2011 to 2012. The number of sales for detached homes has decreased 48% in West Vancouver, 43% in Richmond, and 36% in Burnaby. For Apartments, the numbers are less with 21.5% in Burnaby, 29% in Richmond, and 23% in Vancouver West which includes Downtown Vancouver. What do these numbers and the market communicate to me? It is a Buyers market where buyers have negotiating power, lower priced homes compared to 2011 and 2012, historically low interest rates, and the luxury of time where you aren’t competing to pay over asking price. Sellers need to price their property at market value and come to the reality the market is not where it was in the last couple of years. If the market declines 10% in value, 10% on a $300,000 sale is much less than 10% of a $700,000 purchase; thus, if you are selling to upgrade, it is the right time as you may not get what you expect in terms of selling, but you can negotiate more off a bigger ticket item. I have had four listing appointments since the summer. Two have decided to wait and see what happens in the market and the other two sellers have decided to go with another agent who determined the market value of their home to be higher than my valuation. The outcome is one listing is still on the market, and the other one expired. I approach all my client meetings with straightforward, honest advice. Unfortunately with this approach, I didn’t get these listings recently. As much as I wish I had the listings, I did not give my potential clients the sense of false hope with a higher than market value evaluation, continuously show their home only for the listing to expire, spend my own money on photography and placing it on the MLS, and ultimately, waste my efforts and their time. I personally think that no amount of advertising will attract a consumer to purchase an item that is significantly over market value, especially in a market that lacks demand and activity. Don’t forget, pricing is part of marketing.